Every year about this time, women panic, trying to think of a great Valentine’s Day gift for their favorite man. It’s hard to find a gift that expresses your love that he will actually like! Relax, we’ve got you covered with these romantic gifts that he actually wants! Hot Air Balloon Ride: Take Your Love to the Skies! Take your love to new heights when you experience the romance and tranquility of a hot air balloon ride ! You’ll both remember this romantic ride forever. Hot air ballooning is all about feeling as free as the wind. Leave your cares behind – the calming effect you’ll experience in a hot air balloon seems to put the world below into perspective. After landing, you’ll receive an award and enjoy a champagne toast. Perfect for both the adventurous couple and those who just want to relax and enjoy the scenery. Hot air balloon rides and other exciting experiental gifts are available from Cloud 9 Living . He’ll wear your undying love always with this distinctive romantic watch ! He’ll appreciate the handcrafted workmanship in this stainless steel and diamond timepiece. Timeless Love Watch is available exclusively from The Bradford Exchange Online . Obviously, you’ve got exquisite taste in men! Now spend an evening together, celebrating with a Cristal Champagne & Caviar Gift special enough to reflect your love. Delight in the finest Cristal Champagne and 2 oz of delectable, sustainably harvested Osetra caviar, packed fresh and guaranteed. Included in this stunning gift box is a mother-of-pearl spoon and caviar palette for elegant serving with the included creme fraiche and handmade Russian blini. 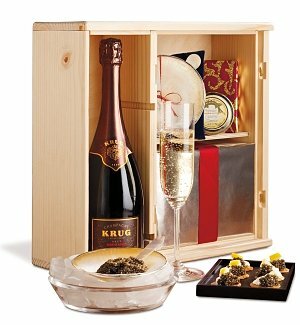 Reserve your romantic champagne gift basket at GiftTree . Start your evening of romance off in style! He’ll love the way these handsome silk boxers feel against his skin. Add extra romance to the occasion by embroidering your names or initials entertwined with a heart. Sterling Heart Cufflinks – in stunning Valentine red – will brighten even the most somber outfit. Want something a little more personal? These cufflinks can be engraved on the back with a special message of up to 8 characters. CuffLinks.com has an amazing selection of cufflinks that are perfect for Valentine’s Day.